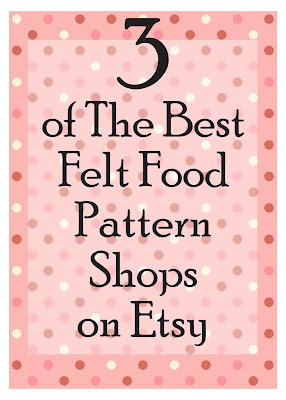 Today's finds are the best, in my adult artist's eyes, felt food patterns on etsy. 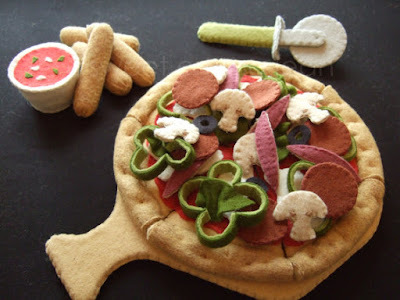 Felt food are some of my favorite things to pin on Pinterest. 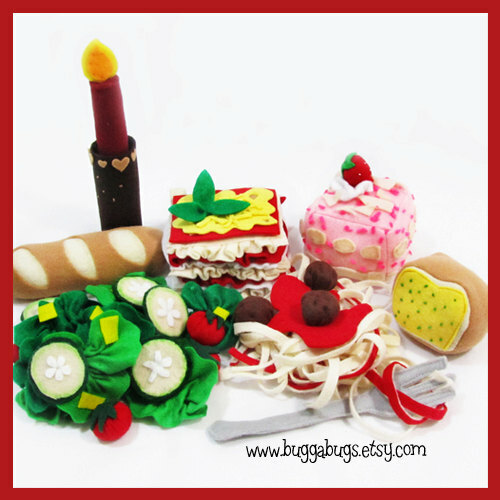 It's also so much more fun and tactile than plastic play food. I don't personally make felt food cause so many people do and are good at it. This may change down the line as I get my pattern shop up and running. 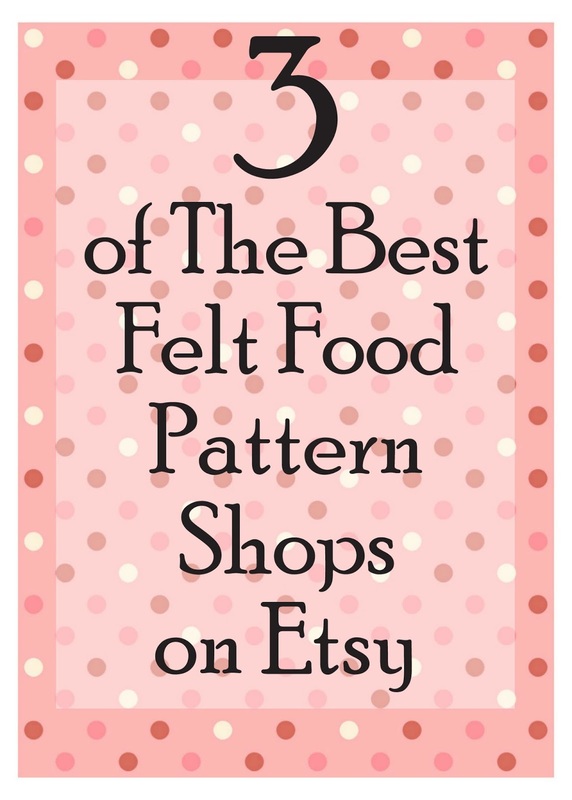 There are a lot of shops that have easy and fun to make felt food patterns and I'll do a post on them another time, today I'm talking about the best of the best. I choose 3 shops that stand far above the rest in realistic detail. The absolute cream of the crop is the shop Sweet Emma Jean. I am blown away by the level of detail her patterns have. She uses pure wool felt for her samples, which really gives her photos a high quality look. 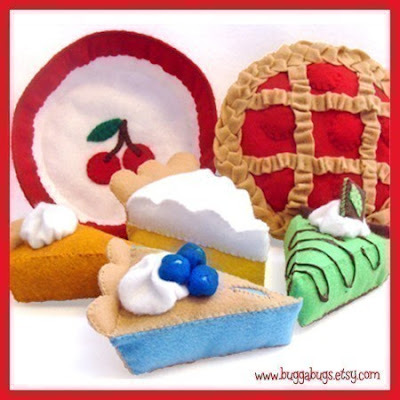 You wouldn't want to use craft felt to make these awesome projects, you could but the result wouldn't be the same. Look at that tomato! And the deviled egg and pickle slices! This maker thinks of everything. Her patterns are a great value because you get more than just the hamburger, you get the whole plate of food. This pizza looks good enough to eat! Look at all those yummy toppings! It comes with a pizza paddle (you know the thing they use in pizza places to pull the pizza out of the oven) cheese sticks to dip and a pizza cutter. This taco dinner has everything from a hard shell taco to a soft shell taco to a quesadilla to a flan dessert. 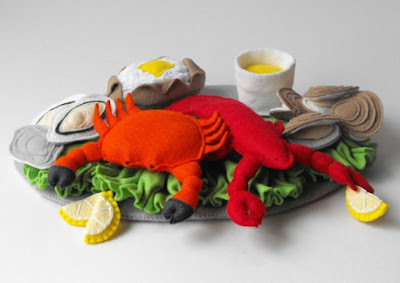 Just beautifully designed felt food. The only downside I see is toddlers might try to actually eat this so it's probably best for children over 4 years and older. 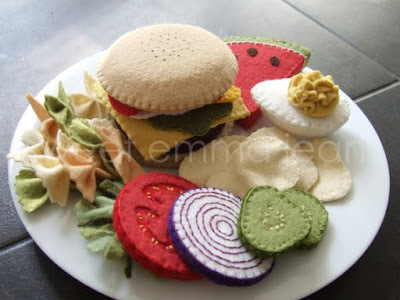 This shop also sells pure wool felt so you can get just about everything you need, except the embroidery thread, and get started making your own awesome felt food. The second shop that's on my best of the best list is Gulf Coast Cottage PDF. I've followed this shop for a long time and have at least one of their patterns from way back in 2008 or 09 and have watched them grow and change. There patterns have gotten more detailed lately and I look forward to seeing how they grow further. 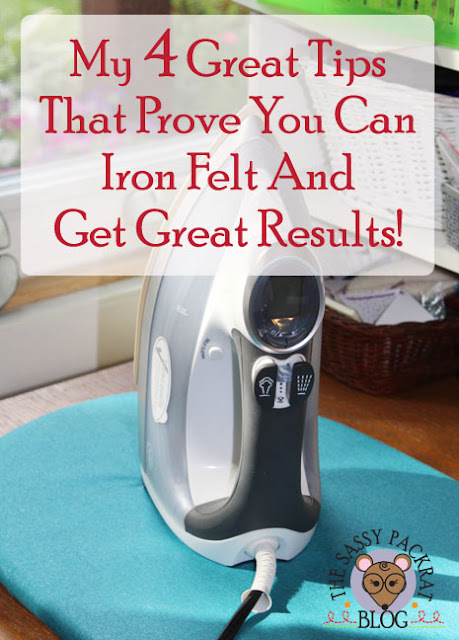 Gulf Coast Cottage's patterns aren't as detailed as the shop above but they are good achievable patterns with a nice level of detail and their accessories are outstanding. This seafood set is so good and has the right amount of detail for small children. A more realistic detail might be a little scary for the small ones. This pattern is a full dinner which gives you the customer options to make what you'd like, without having to make everything. I LOVE interactive play sets and this toaster is amazing! 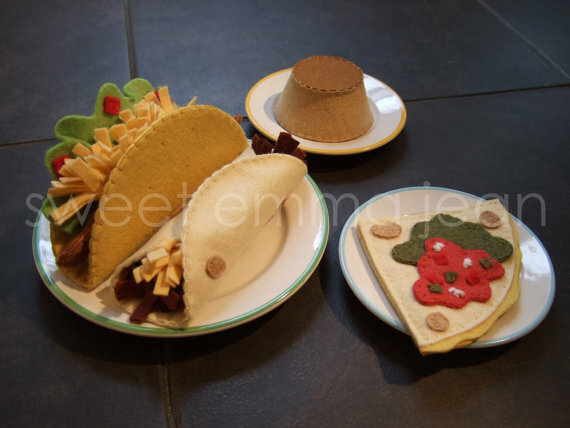 You can actually put the felt food pieces inside! It's not just something you have to pretend to do. 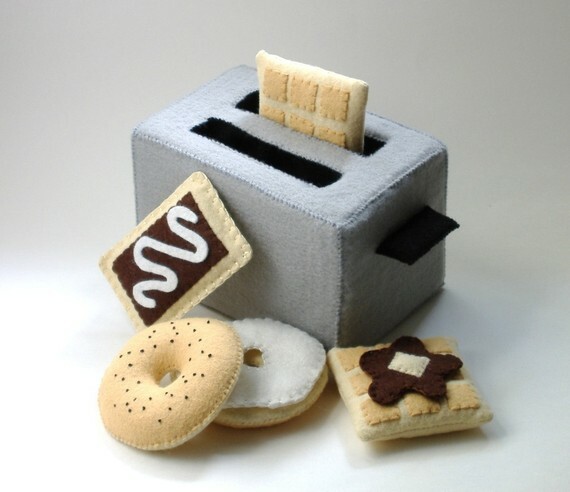 I really like that you get 3 different "toaster items" plus the toaster in this pattern. 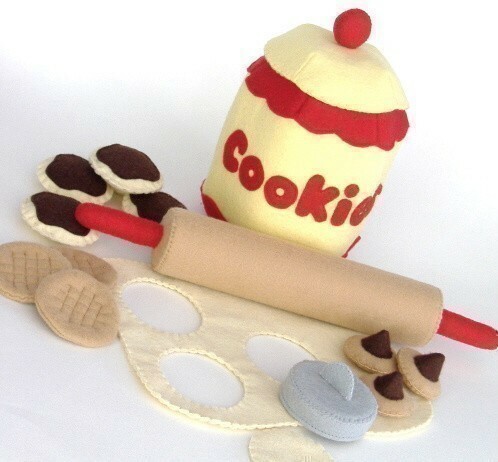 While this is a simpler pattern, it includes everything you need except a cookie sheet (which is available in other pattern set), 3 different kinds of cookies, a rolling pin, cookie jar, rolled out dough and a cookie cutter. I am in love with that rolling pin! Last but not least is Bugga Buggs. 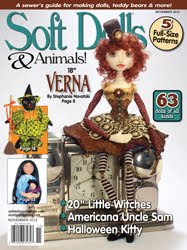 I have a few patterns from them too, when I was first learning to sew with felt. This set has really good detail. Just look at the butternut squash with the seeds, cauliflower and the artichoke. I really like the bright and fun colors used and children will too. This set has everything but the plates. It's a lot of "food" for one pattern and has very nice recognizable details. You get 2 entrees (lasagna and spaghetti) plus salad, 2 kinds of bread and dessert. I love the curly edges to the pasta in the lasagna, great attention to detail! This pie set is a favorite of mine. There is a cherry pie plate, a whole cherry pie and 4 different patterns for pie slices. Look at the meringue on that lemon pie and the details on the blueberry pie and grasshopper pie, not to mention the crust on that cherry pie! So darn good! 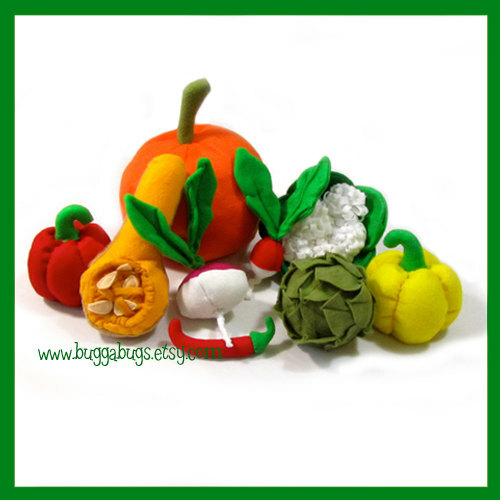 I encourage you to go to these shops and check out their patterns and even buy some and have some felty fun!. I hope you enjoyed my finds for this Friday! See you all next week! I'm thinking about purchasing patterns form different businesses and making them and doing a review on them. Please let me know if this is of interest to you. Leave me a comment or email me. Amazing... thanks for finding the "shops" and posting pictures!! I think the burger plate is my favorite....! I'm so glad you liked this post! I just love these shops.